I really have to thank Mark Acton for this great little tip. He’d come to the studio last weekend for a wet plate refresher and showed me this “hack” for ios 10 on the iphone. It’s a variation on the Night Shift mode which cancels out the blue wavelengths. This one can overlay the screen with just red so perfect as a photographic darkroom safelight. The number of times I’ve used my portable darkroom for wet plate to find red LED light batteries flat or I’ve left my red headlamp outside just out of reach. Now just reach into your pocket and discreetly triple click and turn the screen red. Brilliant. To set it to red screen go to Settings -> General -> Accessibility -> Display Accommodations -> Colour Filters -> Colour Filters (slider button) -> select Colour Tint and slide the Intensity to max. To set the Triple Home click activation simply go to Settings -> General -> Accessibility -> Accessibility Shortcut (way down at the bottom) -> Colour Filters. 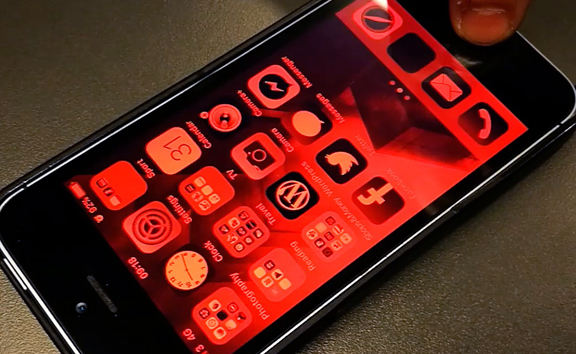 Now just triple click the Home button and switch between normal and red screen. If you have more than one setting applied to the Home triple click a pop up screen will ask you to choose which accessibility function you’d like to use. It’s as easy as that. I’ve tried it with wet plate and it’s safe, not tried it with film or papers but I don’t see why it shouldn’t be safe for those also. Thanks again Mark, a very useful tip. Sorry if people already knew about this one but it was new to me so hence the blog post. PS I think those instructions make sense, let me know if I need to change anything to make it easier to figure out. 31 Jan This entry was written by Fourtoes, posted on January 31, 2018 at 9:34 AM, filed under Misc..